The ‘FIVE’ exhibition is now installed in Worthing. I’ve ‘disappeared’ from my blog for a while because of preparations for the exhibition, so I’m pleased to say it’s all hung and open to visitors now. There’s one photo above of a finished section, and I’ll add more photos of the final installation when I’ve taken some in better light. 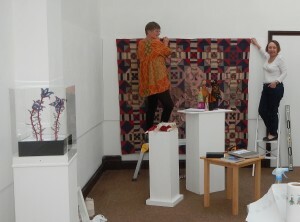 In the meantime, here are some photos of ‘work in progress’ while we were hanging the work. We did have a few ‘headless chicken’ moments, but we were OK once we’d worked out a ‘grand plan’ of what was going where before getting down to details. There’s so much to organise in advance, down to the minutest details like the size and length of screws needed, where to source plinths from, publicity and writing Artist Statements etc. Working out a ‘house style’ was well worth the time invested, to give some continuity for labels etc. The ‘team’ all stayed at my house during the 3 days of installation as I’m the only one local to the exhibition. I have to admit, by the time we were kicked out of the gallery each day at closing time we were ready for a glass of wine or three. My husband is now convinced that textiles are just a ‘cover’ for an eating and drinking group. Mind you, having just taken out the recycling I can see why he thinks that! 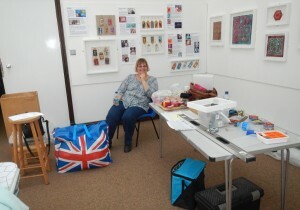 We’re at The Studio Gallery at Worthing Museum and Art Gallery, Chapel Road, Worthing BN11 1HP. If you’re planning to come over, then a good time to come would be this Saturday, 14th May between 2 and 5pm. That’s the one time when all five of us will be there so we’d love to see you then. Otherwise, we’re open until May the 21st, from Tuesday-Saturday, 10.00am to 5.00pm. Do come to see us if you can. Here’s a sneak preview below of part of the room in a panoramic shot. This entry was posted in News and tagged Embroidery, Exhibition, Five, Stitched Textiles, Studio Gallery, textile art, World textiles, Worthing Museum on May 12, 2016 by Jane. 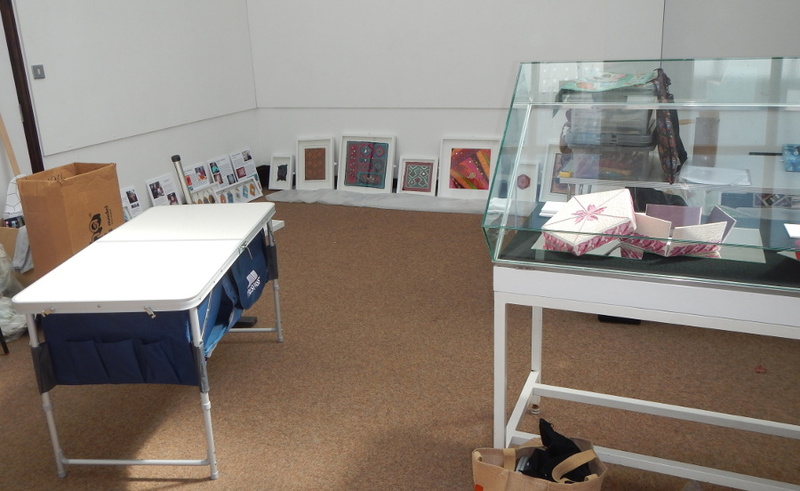 I’m pleased to tell you about our new exhibiting group, ‘FIVE’. We’re a group of textile artists (yes there are five of us – how did you guess?!) who have joined together as an exhibiting group. 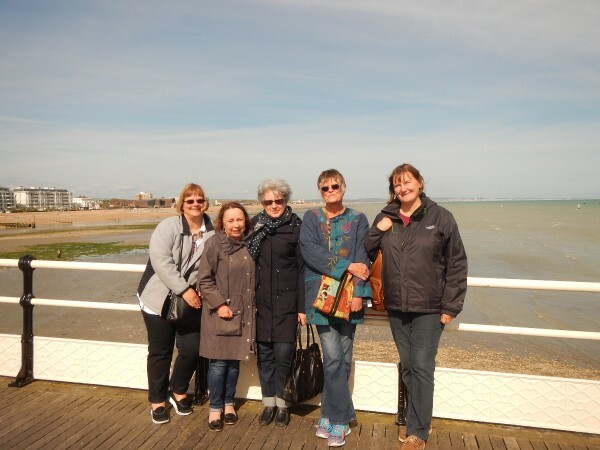 We met through the City and Guilds Diploma course in Stitched Textiles at Missenden Abbey, and became firm friends through our shared love of everything to do with textiles. How lucky you are if you stumble across people with shared interests, and what a joy it is to support and encourage each other along our textile journey. 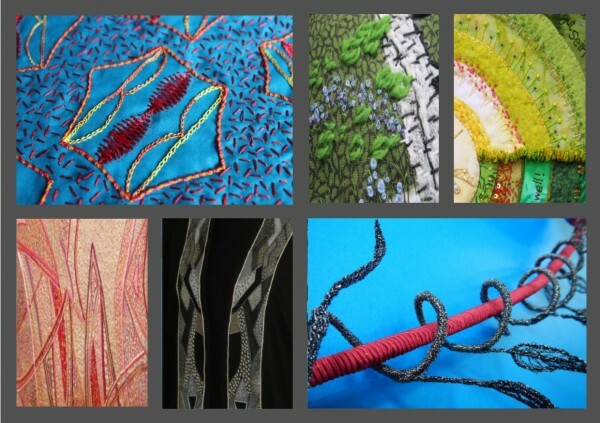 We all felt ready for a new challenge, so we decided to plan a joint exhibition of textile art. 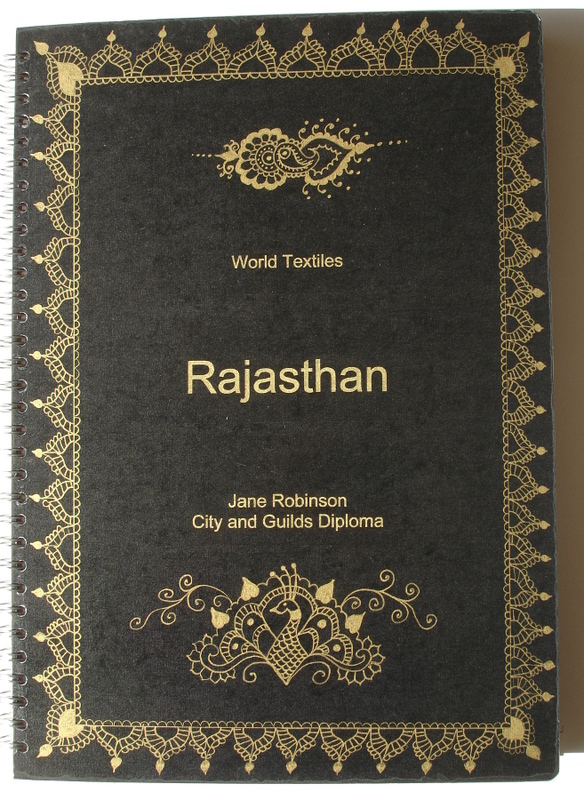 We all love the rich variety of world textiles, which we studied in some depth during our course, and it left us buzzing with new ideas for designs. 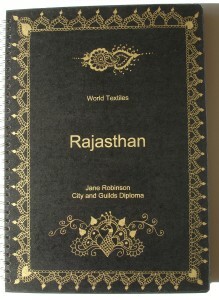 For this reason we decided to base our first exhibition on World Textiles. 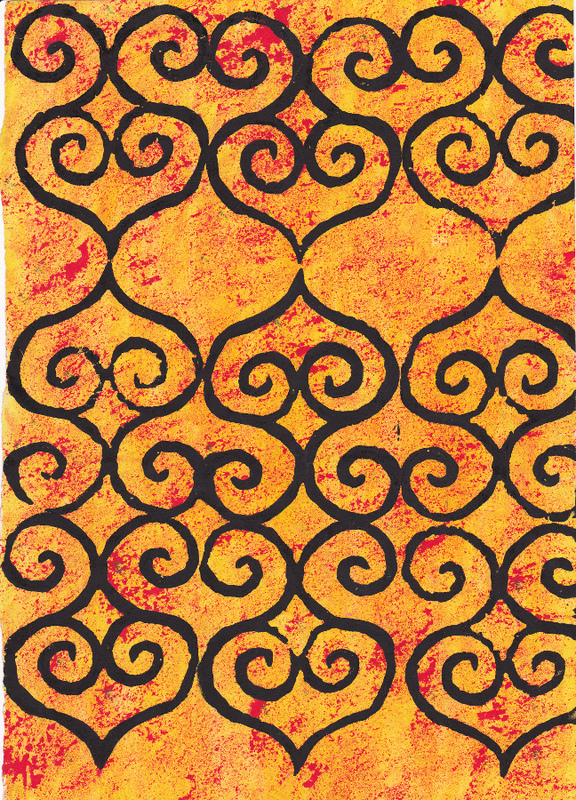 The starting point for each piece is something from the world textiles that we love. It may be a colour combination, a pattern, a shape or function, or it may just be a texture. We’re all working on very different things. 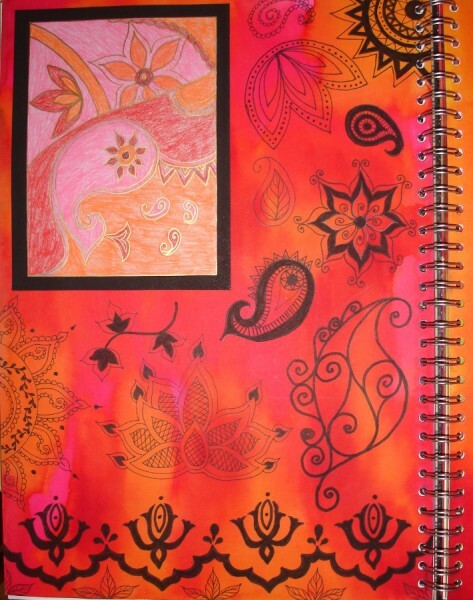 I’m working on a series of Indian-inspired panels, using the bright colours and the ‘sparkle’ of Indian textiles. 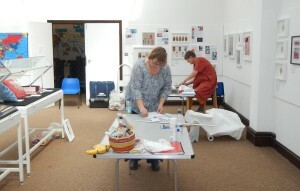 Barbara is working on cushions, some of which are inspired by the subtleties of English embroidery. Elaine is making a series of embroidered mirrors that each reflect the colours and motifs of different continents, all so very different from each other. Suzanne is working on a hand-felted and embroidered jacket in the vibrant and exciting colours and patterns of Guatemala. Cheryl’s ‘family of stitched dolls’ represent family groups from different countries and cultures who are uprooted from one country to another, and the journey they go on as they move from a familiar culture to a new one. They are currently travelling the country, and the people ‘hosting’ them are writing different entries in their travel journal. It will be interesting to see what has appeared in the journal by the time they reach Worthing in May. It’s an exciting and challenging experience putting on our first exhibition outside the more ‘sheltered’ confines of end-of-course shows. It’s all very exciting – I’ll keep you posted. 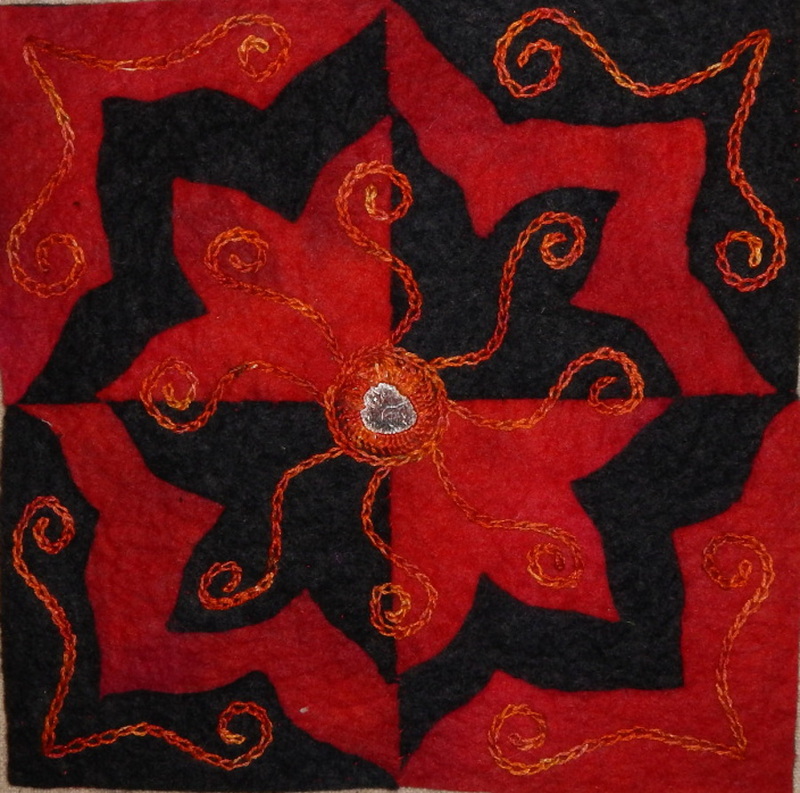 This entry was posted in News and tagged Embroidery, Exhibition, Five, Stitched Textiles, textile art, Textiles, World textiles, Worthing, Worthing Museum and Art Gallery on February 7, 2016 by Jane. I love the vibrant, highly saturated colours that are so special to Rajasthan. Here are some bits of art-work and a couple of stitch-samples from the Diploma course, based on Indian motifs. Designing and making the dress that I mentioned in my previous post seemed like a great opportunity to to explore these Indian themes further. I had reached the doom-and-disaster phase of the project (does everyone get that I wonder???) when luckily my fellow Diploma students and I had one of our get-togethers. Settled in the sun in Elaine’s garden, I had the full focus of three ‘helpers’ to re-pin, adapt, cut and re-tweak the prototype. There was also great encouragement not to abandon the project. I think we ended up with something that looks less like a hospital gown and more like a dress! On that basis I unpicked the prototype and made a new pattern, and dyed the viscose silk velvet to make the finished piece. Here’s the dyed fabric. 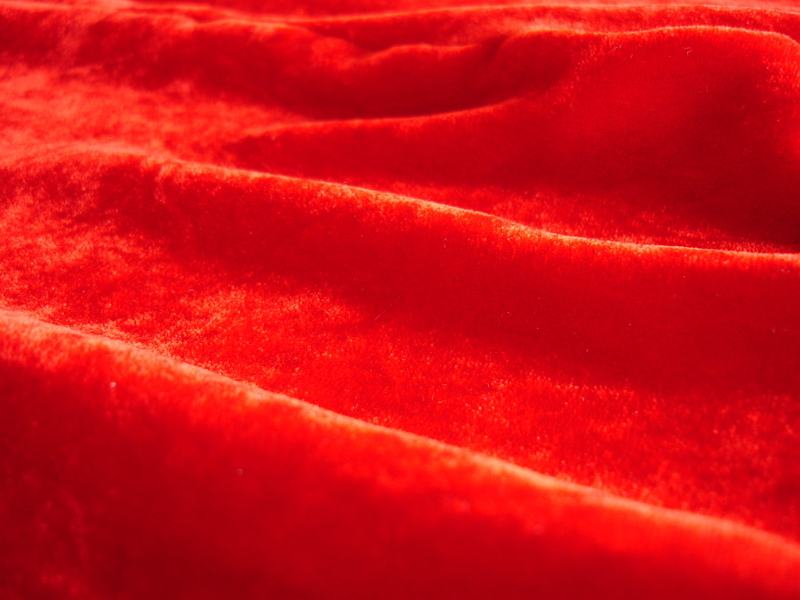 I love viscose silk velvet because of the way it drapes, and catches the light as it moves. It soaks up dye in great thirsty gulps, which means you can achieve a really highly saturated colour. 3 metres of heavy fabric would be difficult to dye evenly by hand, so I did it in the washing-machine using Dylon machine-dye. Strangely, Dylon don’t seem to have a deep mid-red, so I used a tub of Orange and a tub of pinky-red. Luckily my theory worked, and it came out a deep mid-red colour. 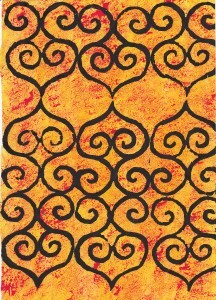 Designs for the neck and hem are based on the doodles below, which are a kind of embellished Taj-Mahal motif. Underneath that are some stitch samples for the dress (Janet trained us well!) Now the dress is half-made-up and I’ve started the machine-stitching on soluble fabric round the neck. I hope it works out OK. Eek! Watch this space! 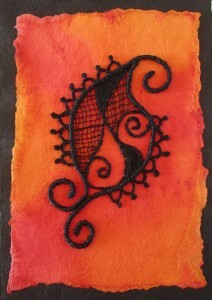 Machine embroidered stitch sample. 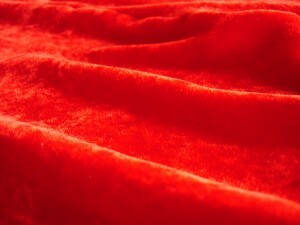 Soluble fabric and viscose silk velvet. 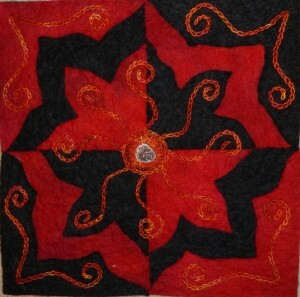 This entry was posted in News and tagged City and Guilds, dress-making, Embroidery, Indian design, Indian pattern, sewing, world embroidery, World textiles on May 31, 2014 by Jane.